Big Red Tent: The Online GOP's Next Big Thing? The American Left’s superiority as exploiters of the new media has been in little dispute in recent years and, though the Right has tried mightily to catch up in this area, more often than not it has failed to succeed in making a lasting dent in the liberal dominance of the online medium. A very telling example of the disparity between the parties’ online, grassroots effectiveness is in the field of candidate fundraising. Act Blue, the Democrat clearinghouse for online donations to candidates, has raised over $25 million for Democrat candidates since its launch in 2004. During that time, the Republican Party has tried and failed repeatedly to achieve anything remotely resembling that level of success in online fundraising (or in most other online ventures), despite attempts to replicate the Democrat systems in these areas and to use them for GOP purposes. The bottom line is, when it comes to succeeding in the New Media -- the internet -- Republicans have found, through repeated trial and error, that the Left’s tactics and techniques cannot be exactly and successfully replicated by the Right. Given this, some leading figures in the conservative online movement have begun to call not for the next attempt to replicate the Democrats’ success, but for the first attempt at the “Next Big Thing” -- something which is new, effective, and built specifically to succeed in the Republican arena, rather than yet another attempt to co-opt ideas and technology designed for (and effective within) the left side of the spectrum. On that front, two veteran consultants from Austin, Texas -- Ryan Gravatt and Brad Jackson -- are currently launching an organization which just may be that Next Big Thing in the area of online Republican fundraising. Called the Big Red Tent (and available at http://www.bigredtent.org/), this new initiative -- almost two years in the making -- seeks to replicate ActBlue’s success as an online clearinghouse for political fundraising, but is designed to do so in a different way -- one which is designed specifically to appeal to Republicans on the grassroots level. 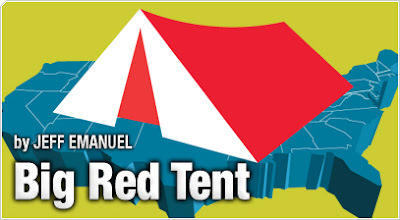 Just what is the Big Red Tent, and how does it work? Quite simply, it is an online community in which any individual or group can participate in three major ways. First, members build a slate of candidates that they support, and expound, on the Big Red Tent site, on the reasons why they were chosen -- whether it be based on geographic location, a certain issue, or whatever other criteria are preferred -- and why they should be supported by more people. Second, members vote on whether or not the candidates recommended by their fellow users should be added to the community’s official “slate,” which would enable them to receive donations through the site. Third, members can donate to candidates on the slate -- the bottom-line purpose of the site, and one which can be utilized even without participating in the first two activities. An online community in the truest sense, Big Red Tent puts the keys to the electoral and fundraising process back in the hands of the grassroots, allowing any candidate to be proposed for support, and allowing activists, concerned citizens, and politicians to reach out to each other and to communicate. Here’s an example of how: Let's say that a Republican living in a ‘safe’ district wants to help support a Republican whose seat is less secure, or who is challenging an incumbent Democrat. Using Big Red Tent's slate-building apparatus, that individual can quickly and easily learn about candidates who are geographically distant from them (and who they might not hear about at all otherwise), find out what they stand for, read ‘stump speeches’ supporting their candidacy, and -- if so desired -- contribute to their campaigns. Not everybody has the time or the inclination to drop $1,000.00 or more to participate in campaign fundraisers; nor should donations of that size or larger be required to gain legitimacy within a campaign. With Big Red Tent, a potential donor can learn about the candidates, communicate with their supporters, vote on adding them to the site's official slate, donate any amount that they wish to as many of the slated candidates as you wish, and encourage others to do the same -- all without having to leave the comfort of their own home. The main idea behind the Big Red Tent project is simple: it is a community brought together by the single, important common interest of raising the funds necessary to elect Republicans to office. By working together to harness the power of the internet in debating candidates, building slates, and combining contributions, Big Red Tent can help Republicans to convince people, to influence elections, and to succeed in their goal of getting Republicans elected. Given this level of interactivity, community action, and ease of use, Big Red Tent may have the potential to be that Next Big Thing that the online GOP community has been looking for. Only time will tell, and the current run-up to the 2008 election is as good a starting point as any for the latest Republican attempt to gain much-needed ground on the online left in the vital area of campaign fundraising. Mr. Emanuel, a special operations military veteran, is a columnist and director of conservative weblog RedState.com.